All files in the GraphicRiver Logo Templates category must be scalable. Photoshop and Illustrator have small variations in the way scalable files are prepared. Refer to the information below for details on each file type. 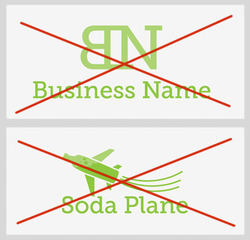 Logo Templates are files that can be modified to have a custom name, tagline and color scheme. Logo Templates on GraphicRiver are distinct from custom, or bespoke logos. “Template” is the operative word. They are scalable and can be used for everything from business cards to billboards and printed documents to web designs. You must avoid designs that are too specific and make sure that your template works well with a variety of names. For example, using a set of letters or words as a graphic element will limit the number of names that can be used when customizing the template. Graphic elements that represent a specific concept can also prove challenging when adding a custom name. If a graphic element relies on the accompanying text to give the design context, it will not be suitable as a Logo Template. Before you begin your design, think about the concept and the ease of customization. It may be helpful to trial your logo template with a variety of names before you upload it for review. The logo must have a graphic element and a name (tagline is optional). The main file must be scalable (PSD and/or EPS). The logo must have editable text. The logo must be suitable for all sizes - from business cards to billboards. Please note that it is important to refine and optimize the elements in your design. Fine details and text won’t print well at small scales. Errors and inconsistencies in your design will stand out when the logo is enlarged. The visual balance of the logo should be aesthetically pleasing. Each element needs to work together to create a unified design. Poor alignment or scaling of the graphic element and text can cause the logo template to look unbalanced. The choice of the font must compliment the graphic element so that the logo appears to be a single coherent design. Non-standard fonts must include a link to the font used in both the item description and a help file. Read our full article on using outside assets for more information. All Logo Templates must be in EPS or PSD format. The file must be CMYK. Files, layers, and swatches must be organized and easy to use. The item must include a help file to list the fonts used. If you chose to use product mock-up for the main preview image, you must also include a plain version of the design, so customers can see the logo clearly. Layers and objects should not be locked. There should be no visible guides. The file must be constructed well. Graphic elements should be made with the minimum number of points possible to define the shapes, this ensures that the paths are smooth. Excessive points can make the file difficult to edit and can show irregularities at higher magnifications. The EPS file must be version 8-10. There should be no stray points. Stray points are invisible points that have no stroke or fill and cannot be seen without closely inspecting your design. 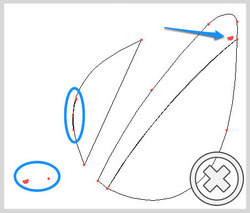 Stray points can occur when lines are cut and deleted or the Pen Tool has been used on the artboard without drawing a path. You can find stray points in a few different ways, one is by looking at your design in outline mode. 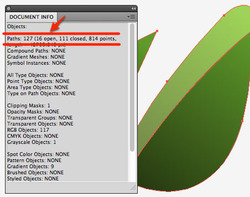 In Adobe Illustrator, you can go to Select -> Object -> Stray Points. There should be no open paths. All filled paths must be closed or they can cause problems when the file is edited and customized. For more information, read Dealing with Open Paths article. Layers and objects should not be hidden. The file cannot contain rasterized elements or un-expanded effects. Logo Templates must be 100% editable vectors and cannot contain rasterized elements. To find rasterized content in an Illustrator EPS file, you can open the Links Panel, go to Window ->Links. The file must not contain rasterized elements. 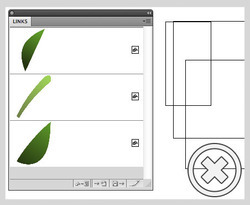 Graphics must be made using paths and the shape tool. Once you have got your print template file ready to sell, you should follow our guide to preparing your item for upload.